During my Biology study at the University of Nijmegen, my minor was Exobiology and my major was Microbiology. 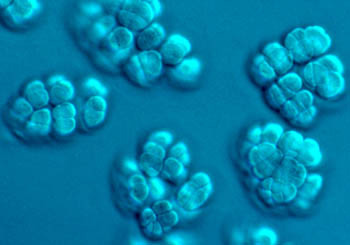 The latter study focussed on the biochemistry of methanogenesis. After graduation, I started working as a PhD-student at the department of microbiology in Nijmegen. There I studied methyl transfer reactions in methanogens. These reactions involve corrinoid (vitamin B12) containing enzymes. I graduated with honor on a thesis titled "Methanol-dependent methyl transfer reactions in Methanosarcina barkeri". My list of publications gives an overview of all articles I have published during and after that period. Next, I started working as a post-doc at the laboratory of Food Chemistry at the Wageningen University were I studied the methyl group distribution of pectin for 3 years. The company Hercules sponsored these studies. After that I worked for a period of 8 months for the Wageningen Centre for Food Sciences. There I studied the galactosyl distribution of galactomannans. My list of publications gives an overview of all articles I have published so far. Links to publications can also be found by searching the web with Piet JH Daas or PJH Daas as a search string. After my university carrier, I started working at Statistics Netherlands. The story continues here.